One of the things that makes the Bella Coola Valley such a pleasant place is the pastoral nature of the valley bottom. 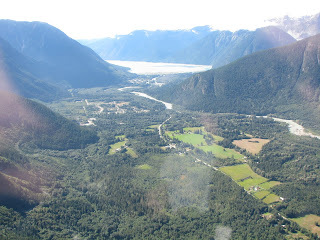 The mixture of small settlements, farms, hobby farms, and pastures in amongst the stands of old growth timber, tributary streams and the Bella Coola River all make for an extremely pleasant view scape and living environment against the back drop of the Coast Mountains. Valleys of nearly continuous coastal temperate rain forests in nearby Kimsquit River or river valleys in South Bentinck Arm and Owikeno Lake are impressive unto their own for their size, extent and value to our economy for forestry, tourism, First Nations and the invaluable role they play for fish and wildlife habitat. It's hard to imagine the Bella Coola Valley would be such an interesting place if all you saw as you drove the length of Highway 20 from the end of North Bentinck Arm to "The Hill" was a continuous stand of valley bottom Douglas Fir, cedar, spruce and hemlock, interrupted only by the odd scoured river channel from one of the side streams. beautiful photo! enjoy your blog and reports. cant wait to visit for the rodeo!